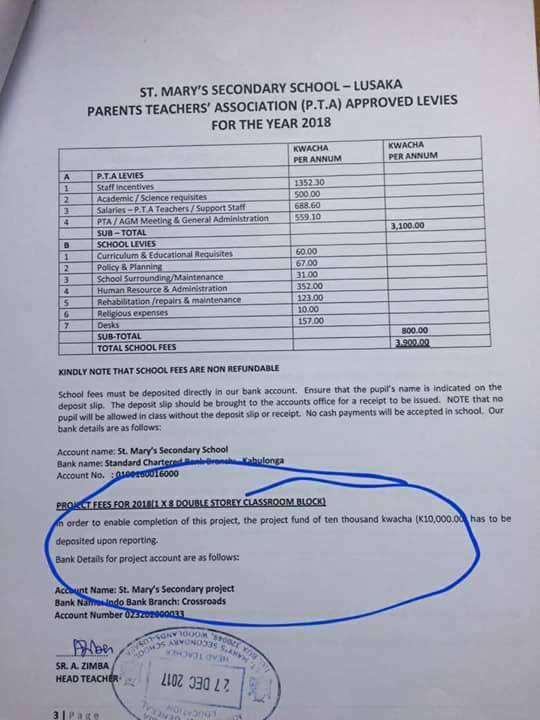 St Mary’s Secondary School demands parents to pay K10,000 for each student a double story building fund project! “This is separate from K3,900.00 school fees”! St Mary’s Secondary School is demanding that each child pays ten thousand kwacha (K10,000.00) for a building project the school has embarked on. The school has put up a project to build a double story classroom block that current students should fund! In a circular signed by Head teacher, Sister Zimba, for approved levies for the year 2018, she has stated that pupils should pay the K10,000.00 and this is separate from K3,900.00 school fees, they pupils should pay!